Just had me fasting blood-glucose test and tommorrow I've got to see Dave, my new cardiac nurse. Not sure what happened to Tracy. Anyway, all this medical stuff and tidying up the front garden a bit (hillwalkers garden syndrome) has stymied any outdoor stuff for today and tommorrow morning. But in the midst of all this blood loss and driveway scraping, Charlie sent me some pictures of our caving trip the other day in Jacobs Well cave at Frosterley. I thought I'd share a few. 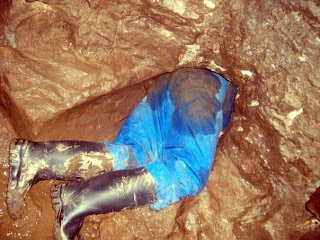 Not sure who it is getting stuck in there - I think he works at Hexham Tesco and he's on his first underground trip. Another ad-hoc old-blokes games trip. Brian rang last night, at a loose-end today and dying to tell us all about his trips to the Commons to talk about cybermoor. We met at Charlie’s house and whilst Charles couldn’t be persuaded to abandon whatever it was he’d planned for the day, he did give us a cuppa and let us change into wet-stuff gear in his office. Wet-stuff gear, on this occasion, being shorts and t-shirt and cheapo boots. 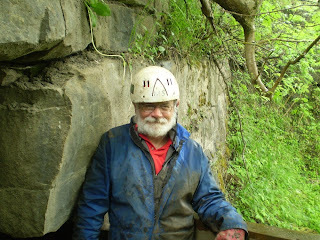 And so, armed with helmets and lights and waterproof boxes for the cameras and car keys and whatever – we marched manfully off up through Slit Wood at Westgate, investigating bits of industrial archaeology and a geocache box on the way. 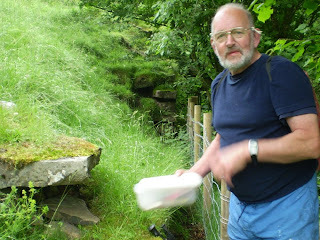 Eventually, we came to the first of our targets for the day – an old lead level with a removable wooden gate. 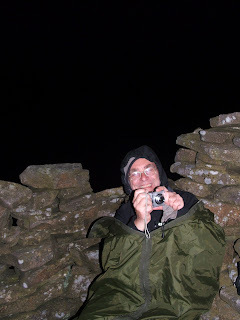 Brian entered first and came out again shortly afterwards whilst I treated the local midgies to some blood. The I went in, covered the 100 metres or so of wet passageway and came out again. I made a video of both mine and Brian’s exits from the hole. Then on to hole number two. There was a walker having a break here – and , it turned out that he’d worked with one of Brian’s neighbours. 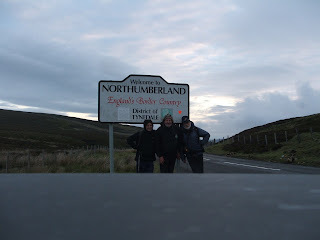 There’s no six degrees of separation in Co Durham – its usually no more that two…. We couldn’t get in the hole as it was barred and padlocked. 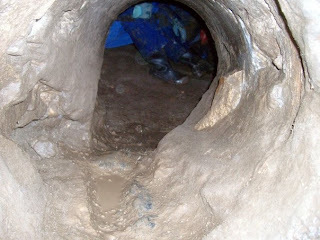 So, on to target three – a couple of culverts carrying the main beck, just next to the junction with the slit vein – an obvious spot when you know what to look for as its been deeply excavated. 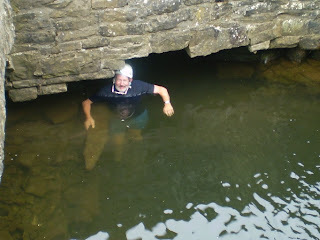 We entered the culvert and climbed down a small waterfall into water too deep to paddle and passed through the tunnel – returning shortly afterwards to investigate an undercutting of the revetments which headed towards a fenced-off shaft. This didn’t go very far and contained lots of loose rubble. Having got wet, we descended by the wettest route possible – in the beck, climbing or sliding down small waterfalls and generally slipping around dangerously. A few pics and a video show the trip – have patience with the video. I picked up Darren Christie early yesterday evening and we went “somewhere”, had a bit of a walk and then distributed a few peanuts in some strategically chosen spots, retreated up a hill, and then, post a vicious midgie assault, retreated a little bit further up the hill where the breeze was blowing – and waited. We didn’t have to wait for to long for the first sighting of our quarry – a small black and white face appeared out of a hole, sniffed around for a second or two and then disappeared again. Too quick to get any pictures. So we waited some more and, just as the daylight was starting to fade, the wind dropped and a seething horde of midgies appeared out of the little glen below us and done us over good and proper – to such an extent that we had to abandon our positions and walk about quickly, hiding our heads in hoods and under fleeces and generally not paying too much attention to what, if anything was going on below. What was going on was that Brock decided that this was a good opportunity to have another look out. 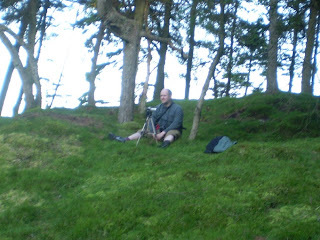 Luckily, the breeze returned and the midgies disappeared, so Darren managed to get quite a good piece of short video of our little badger nervously sniffing the air and deciding whether or not to come out of the hole. In the end he (or she?) decided not to. I suspect our scent was on the wind. It was pretty dark by this time, so we weren’t going to see any more without night vision equipment, so we left badger to the peanuts. I didn’t get any badger pics at all – hopefully, Darren will be blogging something about this trip here http://www.whitespider1066.com/ - I suspect most readers will recognise this blog. But there’s a couple of pics taken before the light went. My photography skills and equipment really aren’t up to this kind of challenge. I’ll leave that to Darren. I’m not saying where the “somewhere” is by the way. Some people like to do bad things to badgers. Me and the wife and the dogs trundled off to Halifax Monday afternoon. The purposes of the visit was for Maggie to go with her dad to his out-patients appointment, for me to bag a little HuMP near Burnley and for Tammy, our eldest and smallest dog to throw up all over the back seat of my car. All of these purposes were fulfilled. In the case of Tammy, she managed a double tick, as she threw up all over my back seat, in the cupholder cupboard thingy and on my headband sweaty thing on the way home. Well done Tammy. 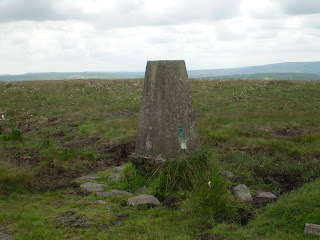 As for my HuMP – one Great Hameldon , a 409 metre rounded, grassy, ever-so-slightly soggy hill with a cracking view of east Lancashire, and , in particular, Pendle Hill. Anyway, me and superdawg appeared, almost as if by magic, but , in fact, by the miracle of Nissan at a picnic place/car park quite near Hapton, which, in turn is quite near Accrington. It became clear from the start that this was going to be a “sweaty do” – in the local vernacular. By the time we’d followed the path through the woods and been dumped in a narrow path between barbed wire with six-foot deep nettles and brambles, even my ears were sweating. 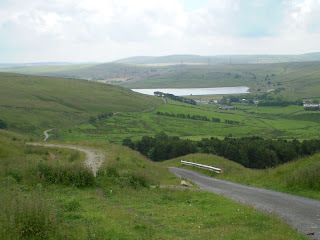 We emerged, scratched and almost intact to the road to Accrington and a lovely path through sweaty woodland and onto the grassy and flowery moor and the old quarries which appear to have produced most of the buildings in Burnley. 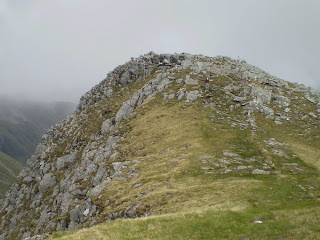 A steep semi-scramble with eyes stinging with forehead-juice and we were on the scarp top where a path beckoned us on. 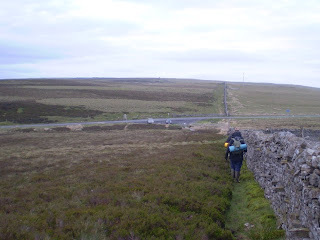 A little way on, a side path lead off over boggy stuff to the rounded drumlin-like 409 metre top with it’s big view. We lunched. We perspired. Bruno panted. I gave him water from my precious supply. He appeared ungrateful. 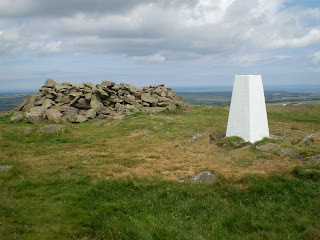 And so we went over to Hameldon Hill, a 399 metre top with a trig point and a weather radar station. 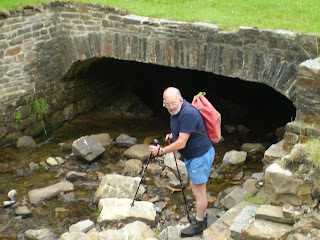 An easy and attractive path took us back to Hapton and the start. We dripped and oozed liquids from all skin surfaces. Bruno’s tongue was much longer than a dog’s tongue should be and waved and dripped. He wasn’t specially happy about the heat. Actually, it wasn’t that hot, but I suspect that humidity was very high, judging by the towering black clouds…. We drove back to Halifax with all the windows open. Just six miles and 1150 (ish) feet of climbing. I should add that I was born about six miles North of this walk, one branch of my family is local and it does feel, a bit, like home. Even the accents of the people who spoke to me seem a bit comforting (its nice when people talk to you) – but I did notice that many of the homes around the foot of this hill had some big dogs…. Not a good sign…. As it was chucking it down in Crook on Saturday evening, I wondered whether or not this trip would turn out to be the wash-out that the last two attempts at a summer solstice vigil were. So I rang Brian and asked him what the weather was like. It was sunny in Nenthead, apparently, so the expedition was still “on”. Brian said he was about to go to bed and that he’d set his alarm for 11:00 pm. 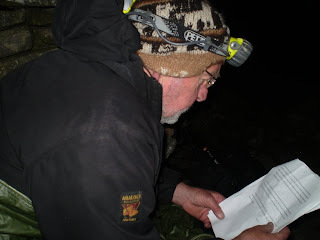 We arranged to meet in the car park at Cowshill and go to a start point from there at midnight. I collected Charlie at half eleven and we went to Cowshill and waited. And waited and listened to Bonzo Dog Doo dah band (Xmas pressie) – and waited a bit more. No Brian. At half twelve, there being no phone signal at Cowshill, we drove over the hill into Cumbria and rang Brian from outside his house. He responded to “get up yer lazy cnt” by a kind of semi-comotose mumbling about something concerning his cat, but by half one, after some coffee, the packing of victuals, lights, and cosy hats and a search for specs and teeth, we convoyed off back through the edge of County Durham and to the very border with Northumberland, just 1.4 boggy and heathery kilometres from Clevison Currick on Puddingthorne edge, a place which a few avid readers of this blog might vaguely remember. 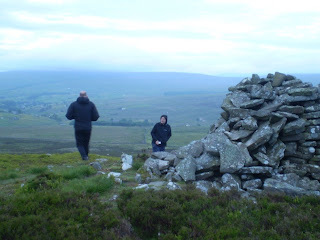 Clevison Currick is a large cairn on a scarp edge of Killhope Law, overlooking Upper Weardale. 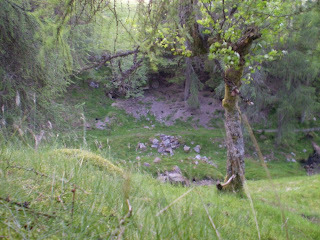 On the East side of the cairn is an open shelter with walls about six feet high and into which is built a seat facing South and some seats facing East. There’s a lot of bouldery rubble around, suggesting that maybe there’s an older cairn underneath. It’s a fairly cosy nook in a Westerly or Northerly wind and has a commanding view. I don’t think its very well known. Anyway, we navigated by GPS and Petzl to the sound of a nocturnal curlew and a whirring snipe and arrived at the currick at about 2:15 am. It was very dark, but there was just a glow in the East – possibly streetlights from the populated bit of County Durham, reflecting off low clouds. 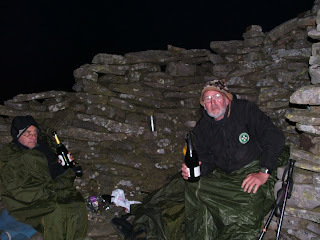 We settled in, each to our Arctic Covers, and the supply of chocolate, grapes and champers we’d brought. I bought the arctic covers in an army surplus shop in Keswick many years ago for £7.50 each, for use by me and the kids on bivvying trips to places like Red Tarn. There still good for purpose. Basically, they’re just very roomy bivvy bags. They’re fab for keeping off a chill wind drifting off a North Pennine blanket bog and seeping through the currick walls. We took a lot of pictures, and you’ll see from the few I’ve posted, that on this occasion, the sky and extensive view of Burnhope seat have been redacted. Slowly, the darkness was replaced by a grey dawn and around half four, we declared that the sunrise must have happened, so we toasted it with some Irish whisky, provided by Charlie. We returned almost exactly the way we came, but this time on a path that we couldn’t have seen in the dark, but which was never more than 20 metres away from our outward route. We’re planning something very similar for the winter solstice – but, perhaps in a different place. Anyway, Traprain Law is a large volcanic plug sitting in some very lush farming country. As is the way with volcanic plugs, it has very steep and rocky sides. These two things, and, probably, the fact that you can get a very nice view of a large slice of coast from the top, could well have been the reason why the local British tribe, the Votadini, chose it for a capital. These Votadini were allied to Rome and kept this fortress well into the 5th century, at which point, it would appear that they moved to Edinburgh – probably just that bigger rock and just that bit further away from the naughty Northumbrians. They weren’t particularly friendly with the folks over at Trimontium, as it happens (remember them?) I expect that when the roman men they go house, there could have been some friction with the chaps at Melrose….. Anyway, it’s a cracking place to fill half an hour if you’re going up or down the A1. There’s probably just about a mile of walking and a couple of hundred feet climbing to get on the top. 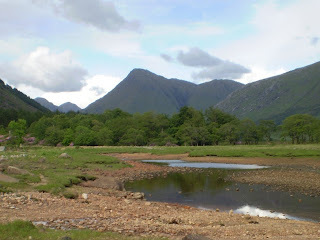 This is the end of the Glen Etive thing. There will be no more Scottish stuff for a while. 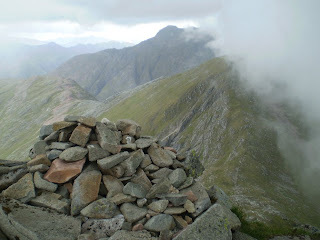 I have socks to wash.
Monday – Mike went off to have a go at Buachaille Etive Mor, which, of course, I have already done. So I spent the morning in a murderous rampage inside the tent plus a bit of light mopping. At some point in the afternoon, I decided to go off and bag the 1800 foot lump of An Grianan (A Little Frog) – who’s summit lies just about three miles from the camping ground – but up the soggy but richly vegetated approach to Trilleachain (Hill of the Budgie Food incidentally) mentioned somewhere previously. 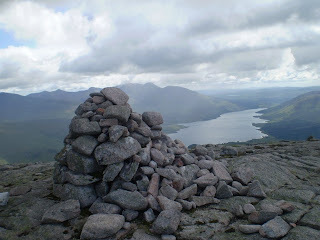 I got there in sweaty weather and dozed off by the little cairn but was awakened by a chill about half an hour later. Clouds and rain were spilling over hills to the West, so, to the barking of a truculent stag somewhere in the woods, I beat a hasty retreat, not quite making it back to the tent by a very wet hour or so. I thought of going home at this point, but dozed off and when I awoke I had somehow consumed half a bottle of South African red and a couple of bottles of Budweiser, so Budwiseley, I decided to go back to the snoozing. 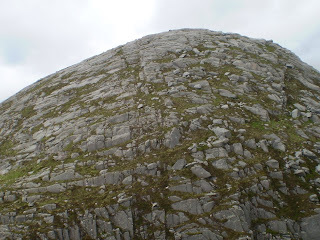 An Grianan was just 6 miles and 1900 feet of uphill. Quite a nice little hill, as it happens, in the midst of so many bigger and craggier lumps. 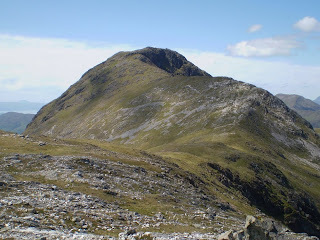 The East ridge of Beinn Sgulaird (Hill of the Teacher’s Pet) looks very interesting from there. A good place where thinking about a difficult problem might produce a result. Usually doesn’t, I find, actually. Sunday the weather wasn’t vastly improved, but we couldn’t be sitting around squashing insects, so we decided on Sgurr nam h-Ulaidh (Peak of the Moisturising Cream). 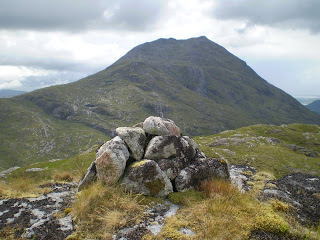 For this, we had to go back to Invercharnan and do the same route through the forest, but instead of turning off for Findlay’s Peak, we went straight on up the corrie – right up the corrie, in fact to a bealach between Ulaidh’s main ridge and Meall a Bhuiridh, its 748 metre outlier. Mike went off to bag this whilst I struggled manfully with the severely uphill bits of this hill. 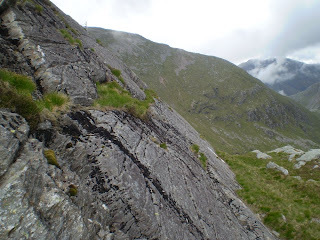 The SMC guide says that the route from Glen Etive avoids all steep ground. Hah! Seems pretty steep to me, in fact, at one point, there’s a slabby crag. 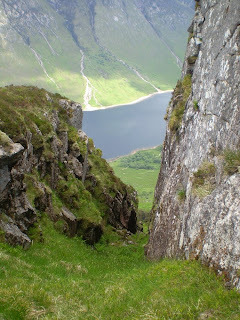 Its not difficult to bypass this with a short and easy scramble – but it’s a crag. Seems pretty steep all the way up. I had about half an hours wait for Mike, during which time the brothers and sisters of the poor souls I had so brutally murdered the day before caught up with me and gave me a bit of a going over. A lad from the National Trust info centre in Glencoe turned up – still with his name badge on. He asked us if we’d done “the ridge” yet?? !? 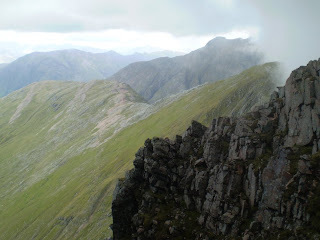 he meant Aonach Eagach. Course he did. We hadn’t and wouldn’t be doing it this time around. I was, by this time, frankly, knackered and up for another day of cruelty to insects. 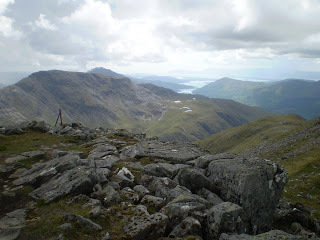 We descended by the steep Corr na Beinn ridge and back home to pull the legs of something. Another 9 miles and 3200 feet of uphill. The views today were improved somewhat (in my opinion) by the loads of fluffy clouds that were in – coming and going and floating around just like clouds do. Luckily, the weather was looking sufficiently iffy for me to excuse myself from anything big and go and bag a little Marilyn I had noticed not too far from the campsite. Saturday dawned wet and itchy in a quite mad running about screaming sort of way. I zipped up the mozzie net of the tent and retreated to my mopping activities. I had energy bars for breakfast – it being far too dangerous to cook. I slaughtered midgies by the thousand., sometimes with a deet-soaked finger and sometimes with a direct tent-fabric-destroying spray. I laughed at their discomfort. I didn’t go for a walk, although Mike decided to explore Trilleachain at about 3:00 pm. Its Ok, though, in Scotland to set out this late because it doesn’t actually go dark in June. I met him later on the shore path. The midgies had succumbed a bit to the breeze. I talked to a lad from Gourock who was firing an air gun at a target, and, occasionally at a seagull. He missed the seagull. He said it wasn't a seagull anyway, it was something else. Looked like a seagull to me. We determined that we could utilise his car-thieving skills to get Mike’s van going if he failed to return from Trilleachain. Apparently, he could organise new number plates… You meet an interesting selection of people in the Highlands. 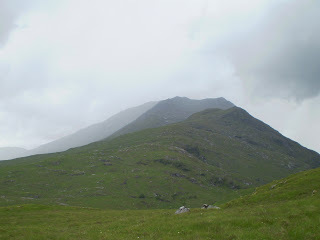 Friday – Day 3 of our Glen Etive holiday was finally time to get down to business and bag a Munro. Anyway, the weather for today’s walk was just about as good as Scottish Highland weather could get – bright, sunny, little wind, and fairly warm. 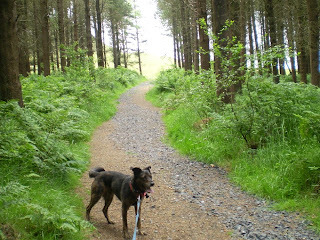 So we parked the chariot at Invercharnan and wandered up the forest tracks by the Allt nan Gaoirean and followed a stream up to the little top of Meall nam Gobhar. A bit of light scrambling and scree-struggling brought us to the Eastern top, scientifically named “Point 841” and a very attractive wander up the long ridge of Fionnlaidh followed, including a couple of slightly off-balance rocksteps, which we avoided on the way down by a neat little rockstep avoiding path which..er..avoided..the..er…rocksteps…. 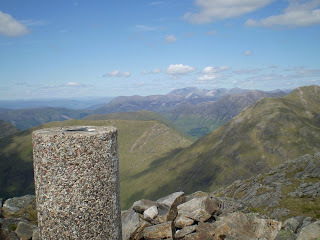 A cracking view from the top included the Paps of Jura, Ben Nevis and some big hills beyond Ben Nevis. Superb bit of hillwalking today and the weather couldn’t have been better. Back to another evening battle with the pesky little buggers at my tent door. 9 miles and 3400 feet of uphill. And, oddly enough, the same amount of downhill. The weather started to break in the evening, unfortunately, the sky turning milky and grey. Not promising. 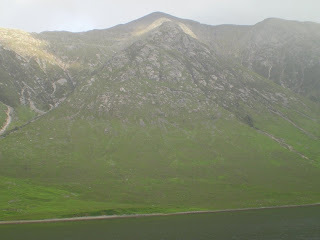 I decided to relocate my tent to the head of the loch, where there is an informal camping ground, and after fighting off a couple of grey hordes of blood-sucking midgleys, went for a little strollette up the local Corbett , one Beinn Trilleachain. 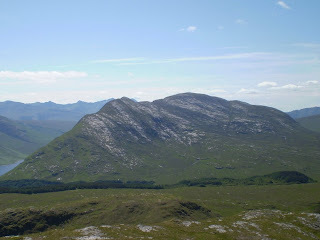 This hill is specially famous for its slabs of granite, upon which a few generations of rock climbers have scared the willies out of themselves. 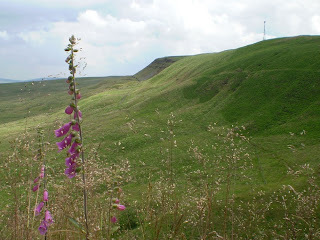 As a walk, it’s a bit damp at first, and the local vegetation is green and lush and hard to fight a way through – but the route eventually starts up the upturned hull-shape of a hill and tiptoes up a few nicely angled slabs, and then down a few more to the final rounded top, where, it was perishing cold. The views all around are quite fab, though and if you have a short half day spare, this is a cracking hill to bag. 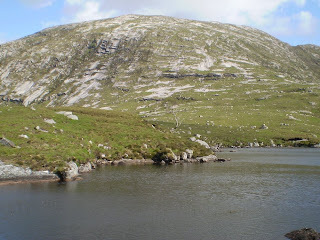 I returned via a lot more slabs to a little lochan and then back to my dinner. Just six fab miles and just about 3000 feet of climbing. Discovered that the tent leaks both water and midgies. Bugger. 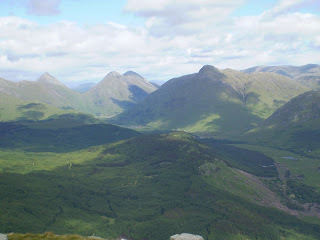 It must have been last Wednesday when I set off for Glen Etive. Whatever it was, it seems a long time ago. 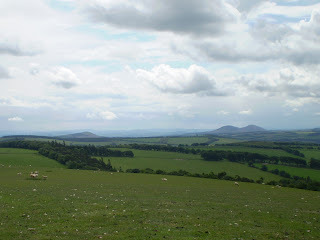 I drove up through the Borders and bagged a little HuMP on the way – a fairly non-descript Boon Hill, quite close to the village of Boon and not too far from Lauder. The best thing about Boon Hill, apart from the ease of it’s ascent, is the view of the Eildon Hills. 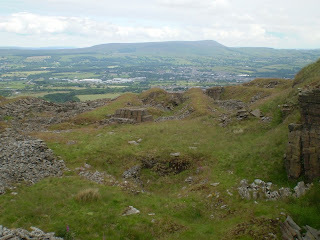 The Romans called these hills and the fort at their foot Trimontium. Three Hills, y’see. You can only see two from Boon Hill. 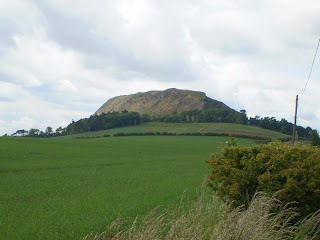 The Eildons are also famous for the legend of Thomas the Rhymer – who, whilst having a bit of a snooze or something beneath a hawthorn tree, was visited by the Queen of Fairies who kidnapped him and made him serve her for seven years, the reward for which was an ability to write poetry. Fair do’s I suppose. Its certainly a warning against dozing off under thorn bushes…. 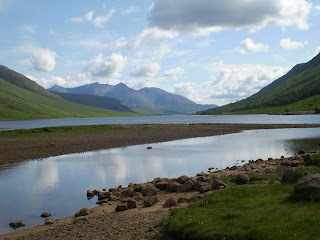 And eventually, I arrived at Glen Etive which, as you can see from the couple of pics, is a spectacularly beautiful place. What you can;lt see is the outrageously high population of vicious and completely mindless midgies who’s only purpose in life is to get a bit of your blood. Most of them die in the process. But they just keep-a-coming. 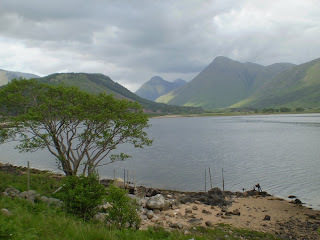 The Glen Etive link isn’t very obvious in the tale here, but there are strong local claims about it. Mike was in his camper van and I camped with the midgies close by. This is me all packed up and ready to go once again - this time for a few days in Glen Etive for the bagging of a few Munro's, and, perhaps a Corbett. I have to return next Tuesday, cos my supply of some of my many tablets runs out on Tuesday. Anyway, the point is, I won't be blogging for a while. There's no phone signal there anyway. 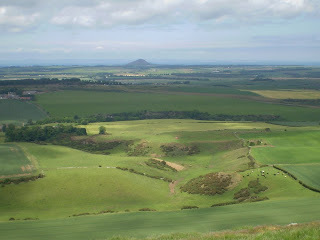 I'll be bagging a HuMP in the Borders on the way - one small and grassy lump called Boon Hill. I'll eat me butty on it. 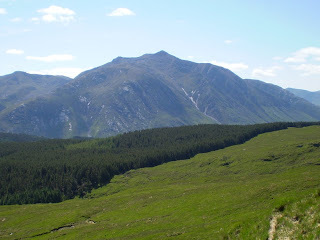 Look - I found a pic of Glen Etive. Nice, innit? Well, I woke up dis mornin’. 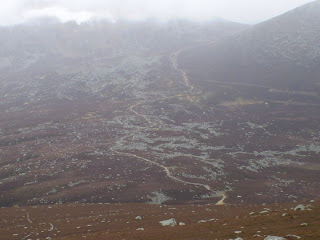 It was chucking it down this morning, so I embarked on a classic hillwalkers fill-a-rainy-day strategy by planning stuff. I’m off to Glen Etive next week so I’ve planned my Glen Etive target hills and whatever hills I might bag on the way up through the Borders and a couple of alternative little bags for the return journey, one in case we relocate to the East if there’s better weather over there than in the West, and one if we don’t. Start at Silecroft near Millom. Black Comb – Corney fell – Ulpha fell – Birker Fell – Harter Fell – Crinkles – Bow Fell – Rossett Pike – Pike O’ Stickle – High Raise – Calf Crag – Dunmail Raise – Helvellyn – The Dodds – Threlkeld – Blencathra – Gt Calva – Knott – High Pike – Caldbeck – Wigton – Kirkbride – Bowness-on-Solway. Altogether, around 80 miles. It ends with a typical TGO plod to the coast on tarmac. I think this would be just about a week’s walking, and the first resupply stop is Threlkeld. Finally, I did some work to the August Howgills diary thingy, which readers of that particular twaddle will be relieved to know will be the last entry. I did no work on my TGO 2009 tale. I’ve got to day 2 so far. The muse has escaped me, but I’m confident that on the day in Scotland that it rains next week, something will occur to me as I have my 14 hour catatonic-in-a-sleeping-bag-listening-to-the-midgies-trying-to-get-in session. As well as being a roundabout in the middle of Bradford, jacob’s Well is a small limestone cave in Frosterley in Weardale. I thought I’d mention that first. Nenthead Brian told me about this event a couple of weeks ago and booked places for me, him and Charlie the ceramicist and Pieblog follower. The purpose of the event was (I think) to introduce people to Carboniferous Limestone caves as part of the annual Northern Rocks festival of Geologically based public events. As it happens, only one of the five punters who turned up weren’t “underground” people (should we call them “The Trogs?”), which meant that our guide could, to some extent, allow us a little more freedom than he’d first planned for. 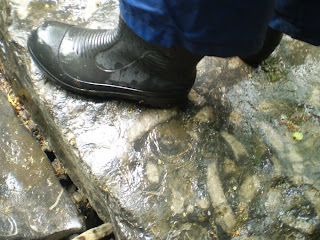 Northern Rocks is held every year and is a programme of walks and events with a Northern Pennines Geological theme – which means Carboniferous with a dolerite intrusion here and there and lots of valuable minerals and industrial archaeology…. 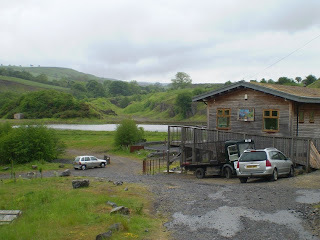 Its part of the AONB and the European Geopark stuff…. 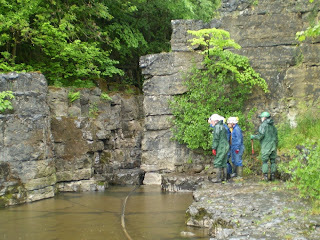 Also – in the gorge, there’s a large area of Frosterley marble. This contains a substantial number of coral fossils and for those who don’t like dark holes in the ground – a good place to see this rock is in the Chapel of the Nine Altars and St Cuthbert’s shrine in Durham cathedral. The theory is that this is, in fact, the very spot where those pillars were quarried – I believe, some 800 years ago. 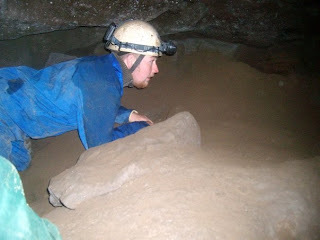 And so, after trampling all over this valuable stone, we entered the cave and walked and crawled and got muddy. At one point, the main passage has been walled off by a thick wall of brick encased in stone and what appears to be Victorian concrete. At the foot of the wall, a small, round mouse-hole of a hole has been punched through and three of us braved the extreme squeeze to get through to the other side. After coffee and cakes, me, Brian and Charley repaired tp the Hare and Hounds at Westgate to have a short interval of light boozing and taking the piss out of the politicians on the telly post some kind of election they’ve apparently been having (As we’ve not had any local politicians who could be arsed doing any campaigning, safe in the knowledge that their personal fortunes will be safer if nobody was actually aware of their existence, I’m just assuming that an election was taking place. If there were any local candidates, they didn’t make themselves known or if, indeed they had any policies other than establishing large personal pension plans. As they couldn’t be arsed with their bit of electioneering, so could I not be arsed voting for any of them. Whoever they are. It doesn’t really matter anyway, cos they all have the same basic philosophy which concerns attempting to increase happiness by the promotion of the acquisition of new electrical equipment and other white goods. Nothing to do with warmth or compassion or any of that rubbish. There’s no money to be made from that. Anyway, Jacob’s Well Hole is a fun hole to crawl through. We’ll probably go back, I shouldn’t wonder. I got a phone call from India this morning and a pleasant lass (with whom it would be impossible to have a rant 'cos she'd just sympathise till you'd stopped) told me that the email I got was an automaed one and I wouldn't be getting new wires and plugs and software and passwords and phone numbers and that all I needed to do was oay£2 a month less than previously and would it be OK to say that the issue was resolved. I agreed. BT's occupation of the ex-British Empire was confirmed by a second phone call from a lass with, apparently, a South African accent. She didn;t know about the other call. I told it was all right now and that it was resolved. The remaining mystery was , what was in the undelivered envelope with money to pay? Pic shows foamy boots for no good reason at all. Never put washing up liquid in your boots before having a paddle.